Washington is attempting to seize on momentum produced by a sweeping victory for US-backed opposition in Malaysia by ratcheting up pressure across the rest of Southeast Asia through US-funded opposition groups, US-funded media, and US-funded and directed fronts posing as nongovernmental organizations (NGOs). This includes in Cambodia where the opposition headed by the now jailed Kem Sokha has been barred from elections. 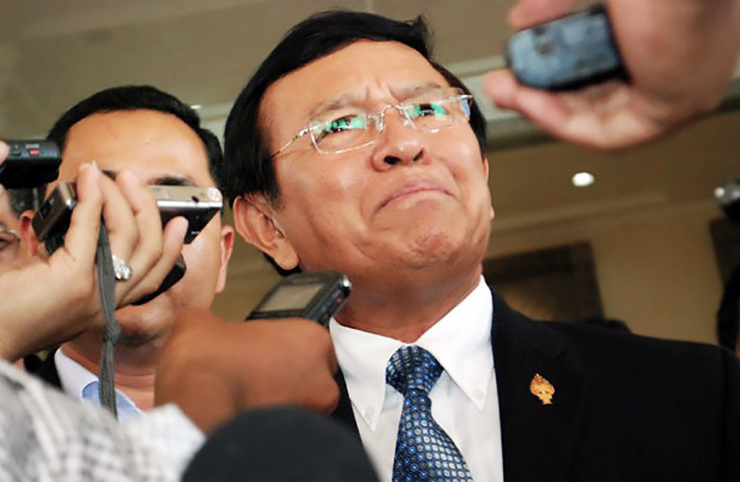 Kem Sokha is in prison after being convicted of sedition. Kem Sokha had trekked to Washington annually for years to lobby US senators like Richard Durbin and John McCain for support. He had repeatedly bragged about conspiring with the US government to seize power. Of course, even the New York Times admitted that the US government had likewise overthrown the government of Serbia through networks like the US State Department’s National Endowment for Democracy (NED) and its subsidiaries Freedom House, the International Republican Institute (IRI), and the National Democratic Institute (NDI). It should be noted that Senator McCain chairs the IRI. Yet despite the open conspiracy to overthrow Cambodia’s government and install a US client regime headed by Kem Sokha and his Cambodia National Rescue Party (CNRP), there have been attempts across the Western media to deny Washington’s role, particularly in the wake of now years of accusing and condemning what the US calls “Russian meddling” in US politics and elections. The United States has been busy in Cambodia these past few months, if Hun Sen’s government is to be believed. Between trying to overthrow the government and secretly backing the now-dissolved opposition party, it has been supporting journalists who report “fake news” and spy for Washington. One would believe that the Washington Post’s initially unprofessional introduction would be balanced by a factual, point-by-point rebuttal of accusations concerning US meddling in Cambodia. The Washington Post never provides any background regarding Licadho. Those who take Washington Post’s narratives at face value likely assumed the organization is independent. Those who actually visit Licadho’s website will find a long list of US and European sponsors providing it tens of thousands of dollars in funding – including USAID. Next, the Washington Post cites Kem Monovithya, the daughter of Kem Sokha who lives in Washington D.C. and is a regular attendee of US government events organized to provide support for Kem Sokha and his CNRP. The article also mentions that the Cambodian government shuttered “independent media,” but then cites US government-funded and run Radio Free Asia and Voice of America – both of which fall under the US government’s Broadcasting Board of Governors chaired by the US Secretary of State Mike Pompeo himself, and Under Secretary for Public Diplomacy and Public Affairs Heather Nauert among others. The Washington Post also cites Nop Vy, executive director of the Cambodian Center for Independent Media (CCIM). Again, like Licadho, a quick visit to the CCIM’s website reveals that it is funded by multiple US NED subsidiaries including Freedom House and IRI as well as the British Embassy and George Soros’ Open Society Foundation. Next is the Cambodia Daily, which the Washington Post claims is an “independent” and “influential English-language newspaper.” However, the Cambodia Daily was founded and is owned by an American, Bernard Krisher. From Cambodia’s opposition political party itself, to media organizations supporting it, to supposed “rights advocates” opposed to the current Cambodian government, the Washington Post failed to name one that was not either directly funded and run out of Washington, or literally living in Washington. The Washington Post’s article concludes by noting China’s increased role in supporting Cambodia, including military cooperation and even alleged help in establishing media outlets such as Fresh News to reflect the government’s side of the story. The Washington Post depicts this as somehow the tides turning against “freedom” and “democracy,” apparently unable to appreciate the rich irony demonstrated throughout the entire article. If Beijing helped create favorable media for Cambodia’s current government – Washington helped the opposition create a tidal wave of unfavorable media against it. The article also makes mention of neighboring Thailand – another nation US regime change is hard at work against – with a similar network of US-funded fronts aimed at the current government in Bangkok, the nation’s powerful military, and its popular constitutional monarchy. It is clear that Cambodia’s political conflict is not one between democracy and dictatorship – but of US-backed proxies representing interests in Washington and on Wall Street from the other side of the planet, versus an incumbent government who has chosen to build ties with a nation residing in the same region – Asia – with whom Cambodia shares many historical, cultural, economic, and political ties. The fig leaf of “democracy’ blows away in the wind for US meddling and propaganda like Anna Fifield’s article in the Washington Post when realizing democracy’s first and foremost purpose is self-determination – not a fate and future determined by Washington. The opposition, media, and “rights advocates” the US finds itself funding around the globe require such funding because they represent agendas local populations see straight through and do not support themselves. It would seem a group unable to find any support among the people it claims to represent – and thus resorts to taking foreign cash and support – couldn’t be any more undemocratic. For the Washington Post whose slogan is, “Democracy Dies in Darkness,” an article that cites sources whose relevant backgrounds and conflicts of interests are intentionally concealed from readers is a cloak of darkness itself.